Lynch's Ferry Magazine | A Journal of Lynchburg History - Eye Witness Testimonies: Dr. John D. George, Jr. Eye Witness Testimonies: Dr. John D. George, Jr.
My name is John George. I went into West Point in 1954 and graduated in 1958. I was commissioned as an infantry officer. I went to Ranger school and joined the 82nd Airborne Division at Fort Bragg, North Carolina. Then, I went to Fort Hood, Texas. There I met my commanding officer, who was a three star general and I was his aid. Part of my job was to write speeches for him as well as look after his family and staff. I watched as others went off to war while I did paperwork, and I was eager to go myself; after all, we soldiers march to the sound of the guns. Finally, after much badgering, my commanding officer allowed me to go. I didn’t question my role in Vietnam. The definition on an army is a body which extends by force, or threat of force civil policies which can no longer be carried out through civil means. My only job in Vietnam was to find and destroy the enemy. My experience in the war wasn’t the same as most. 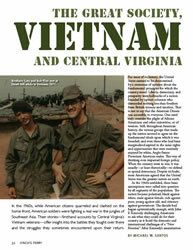 I was stationed at Chu Chi and Bien Hoa, about 45 miles northwest of Saigon. I was a G3 planning officer for the 25th Division. I was responsible for all combat operations, or MR4’s, south of Saigon. I spent most of my time doing this, from six in the morning to one at night. Combat started for me on my third day in Vietnam. I was driving a tank when an armored vehicle detonated a mine. As soon as that happened, we were fired on by RPG’s. There was an artillery unit not 100 yards away from us who were off duty, playing a game of softball. They were totally removed from combat; in fact, they were totally oblivious to the fact that there was a fight. That was the nature of the war; an isolated firefight can start anywhere. I was also an airborne officer, one who directed troops from helicopters, and spent over 500 hours in the air. For every 100 hours I spent in the air, I was given an Air Medal. I also received the Bronze Star and the Combat Infantryman badge for my service in Vietnam. I didn’t receive the Purple Heart because was never wounded. At night, I slept in a hole because of 122 mm rockets the enemy shot at the base. If a shell were to land anywhere beside my hole, it would protect me from shrapnel. If the shell hit my hole, I would’ve been killed. One thing that I learned from Vietnam is that one should be grateful for what one has. I learned that any bed is better than a hole in the ground. I came back from Vietnam after my first tour. I went to the University of Alabama to get my master’s degree and my Ph. D. I was called by General Norman Schwarzkopf, who was my company commander during my sophomore year back at West Point. (I used to turn on the heater for him in the mornings so that he wouldn’t have to wake up to a cold room.) He asked me about my future plans and when I told him that I was going back to West Point, he suggested that I take another tour in Vietnam, so that there isn’t a six year break in service. I took his advice and went back to Vietnam in ’71. The war in ’67 was different from the war in ’71 which is when I started my second tour. In ’67, we had the support of the people back at home, but by ‘71 support had dropped. Parents were telling their children to run off to Canada to avoid the draft, and the morale of the troops had changed. Drug use was rampant in the army by this time. One of the most tragic experiences of Vietnam was when one of my men shot himself while he was high on drugs, and I had to write the letter to his parents explaining that their son was dead. When I returned from my second tour in Vietnam, I went back to West Point to teach for three more years and started a Army Officer’s Fellowship. I retired from the military in 1979 and came to Liberty University to teach in 1990.